This coffee table was no different. I stumbled across this LACK Ikea coffee table for $3 at our local thrift shop! It needed a little TLC…nothing I can't handle and I had a vision. I puttied the holes since there were actually a few chunks out in the wood, but nothing a little wood putty couldn't fix. I then primed the entire piece, and then painted it white. Next I sanded it, and then painted a rough outer border a grey color. Then came the fun part! After the grey color dried, I taped off my greek key design…. ….added a second coat of the white paint color over the table and pealed the tape off (which revealed the pattern), and sealed it with a couple coats of polyurethane. Here you go! A perfectly good coffee table for a fraction of the price!! 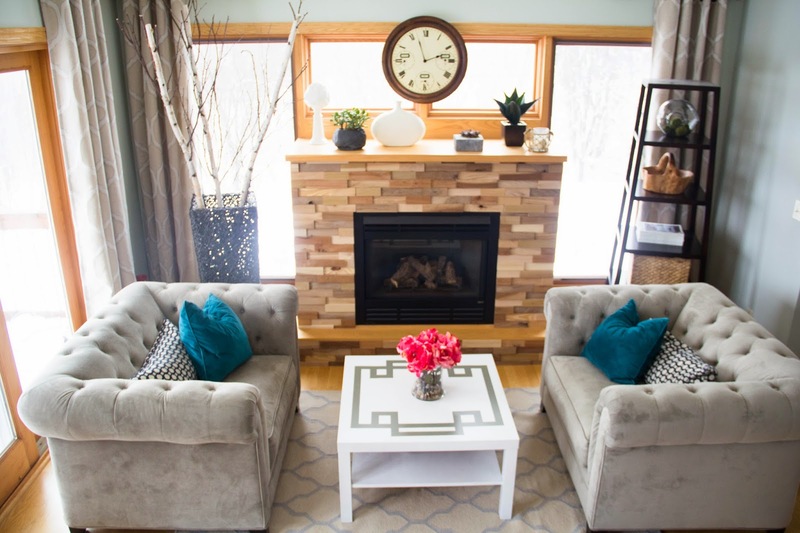 In case you missed it, check out the before and after's of our sitting space here! What awesome thing have you thrifted lately? I'd love to hear about it! I'm linking up to Remodelaholic this weekend! Go check out some other amazing home decor projects to try on your own!